After yesterday’s spring sunshine and warmth I was unprepared to wake up to the drizzle of rain outside my window this morning. 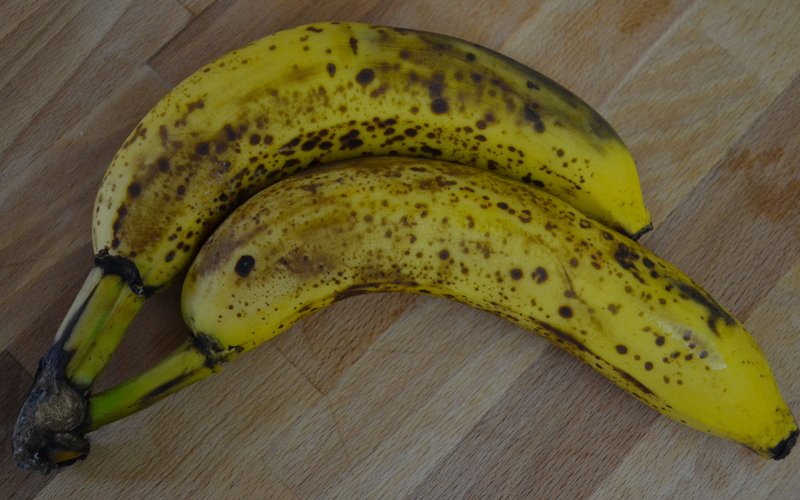 I wandered into the kitchen to pour myself a cup of hot coffee and glanced across the counter to see two ripe bananas whose smooth skin was now freckled with large, dark spots–like an Andy Warhol with a little Jackson Pollok splattered on top–making the bananas nearly as brown as they were yellow. 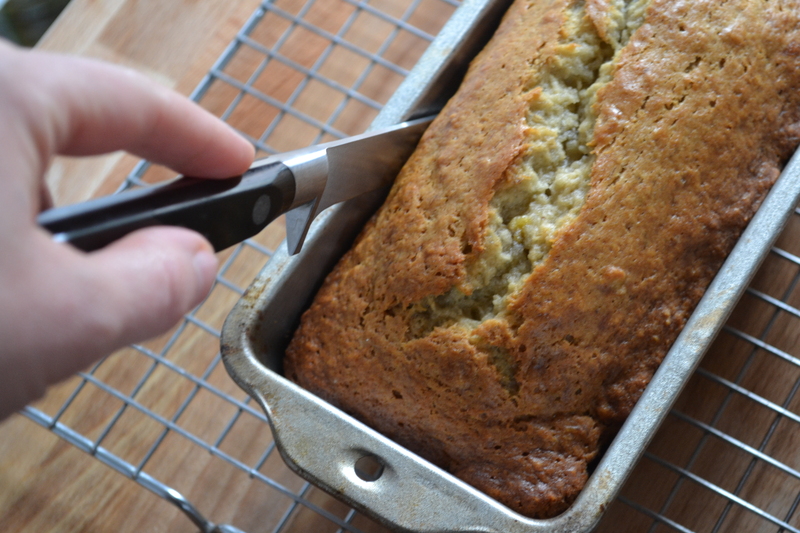 The combination of the overcast skies and overripe bananas could only lead to one thing–banana bread. 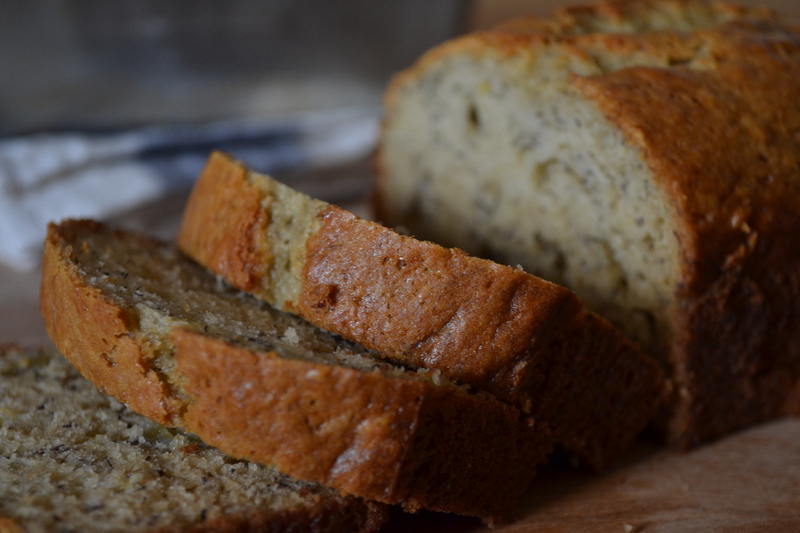 This banana bread recipe is the one my mom has used for as long as I can remember, but as with most recipes, I’ve tinkered with it a little (sorry, mom…). The key to really good banana bread, as my mom taught me, is having bananas that have traded their firm starchiness for mushy sweetness. This is when bananas have that true banana flavor. My little family of monkeys eats a lot of bananas, but occasionally a few turn brown before they’ve been used up, and despite my assurances the kids won’t go near a previously yellow food that has turned the color of motor oil. You can put your overripe banans in the freezer and use them for bread making later, if you don’t have time to do it when they are at their peak, or if there aren’t enough of them for a full recipe. They will only get better after turning completely brown in the freezer. Throw the whole banana in the freezer, or remove the skin and put them in a plastic bag. Defrost them on the counter just before using. If you don’t have bananas that are brown or nearly brown, then make something else, because banana bread won’t taste like bananas unless you do. Luckily, I had one in the freezer to round up to the three that I needed for this recipe. Preheat the oven to 350°. Sift the flour, sugar, baking powder, baking soda, and salt into a large bowl and whisk them together. Because of the humidity on the East Coast I sift all of my dry ingredients, even my sugar, after I measure them. Otherwise I get clumps of flour in my food, and nobody wants to bite into a little pocket of unincorporated flour, or worse–baking powder. In a smaller bowl, mash the bananas with a potato masher, pastry cutter, or fork. I don’t like chunks of bananas in my bread, so I mash them pretty well, but they don’t need to be pulverized. Crack the eggs into the bowl (be careful not to get any shells in the bananas) and add the oil. Stir, thoroughly mixing the banans, eggs, and oil. You want to incorporate the wet and dry ingredients with as little mixing as possible, which will make the bread tough. Pour the banana mixture into the flour mixture and fold the two together with a spatula or large wooden spoon. Let the loaves cool on a wire rack for about 20 minutes before turning out the bread directly onto the rack to continue cooling. 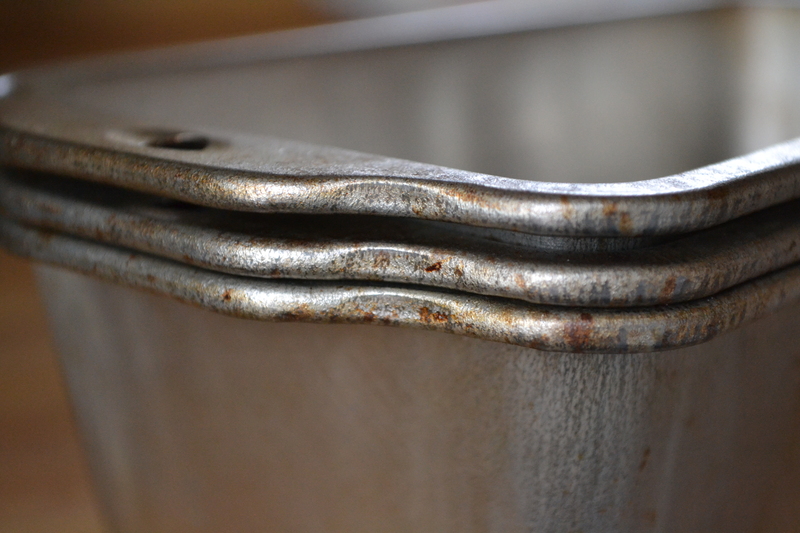 Run a thin knife along the sides of the pan to loosen the loaves before you remove the bread from the pan. Let the bread cool for another 10 minutes or more before cutting, otherwise your slices may fall apart. 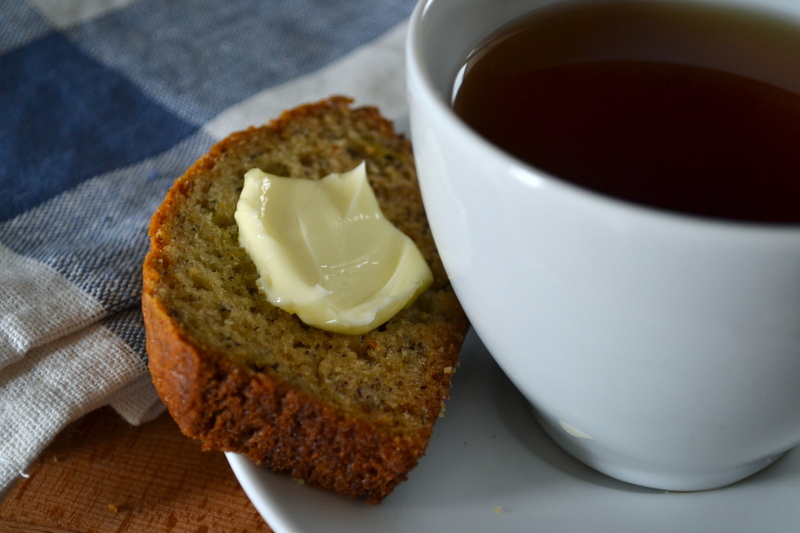 Enjoy with a pat of butter and a cup of tea. Wrap the remaining bread in plastic wrap and store on the counter for a day or two, or wrap it in aluminum foil and put it in the freezer for the next rainy day. I just made this in muffin form as “cupcakes” for Nayeli’s second birthday party. I made a simple cream cheese frosting (dyed pink or purple with frozen raspberry or blueberry juice). They were fantastic! I’m LOVING your blog Brin! I can’t wait to try more of your recipes. I also dig the little window into your life. Those sound delicious. I’ve made these as cupcakes with chocolate frosting, but cream cheese sounds awesome–especially with the little bit of coloring. I can’t believe Nayeli is 2!!! I’m glad you are enjoying the blog. It’s been a lot of fun for me to write. I like that you can just toss the over-ripe bananas in the freezer and make the bread anytime. I wish there were more fruits and veggies that had such a convenient second life. Yum-yum! The recipe sounds great and your photos are thoroghly mouth-watering! I hope you’ll try it! I’m glad you like the photos–they’re half the fun of having a blog. The other half, of course, is eating all these treats. Brava: another acolyte of the “don’t over-mix” method of baked goods. I remember once eating a coworker’s banana bread that truly had the texture of rubber, and I knew she didn’t adhere to “my” method. I’ve been using the same banana bread recipe–a la Gourmet magazine–for probably 25 years. Butter, no oil, three bananas. It’s all good. I bought a muffin from a coffee shop the other day and it was so tough I could hardly stomach it. I’ve never tried butter in this recipe, but I’m sure it would be great. I’ll have to try that next time I have some funky bananas.